Using data from the Bureau of Labor Statistics (BLS) and projections from the government-backed Projections Managing Partnership (PMP), we mapped out the top jobs by growth rate (as opposed to plentifulness). A solar panel installer is the fastest-growing job in eight different states, including California, Hawaii, New Mexico, Florida, North Carolina, Missouri, Minnesota, and New Jersey. It is also known as a “PV installer,” and “assembles, installs, and maintains solar panel systems on rooftops or other structures.” . . . There are more and more wind turbine service technicians in states like Colorado, Texas, Nebraska, and Iowa. The BLS defines these workers as those who “inspect, diagnose, adjust, or repair wind turbines” and “perform maintenance on wind turbine equipment including resolving electrical, mechanical, and hydraulic malfunctions.” Read more here. Another strategy is to search local and national solar and wind energy companies’ websites for renewable energy jobs postings, or major nonprofit organizations if you are interested in renewable energy advocacy jobs. 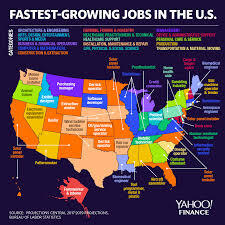 This entry was posted in Nebraska / Midwest News, NewsBlog and tagged Bureau of Labor Statistics, fastest growing occupations in the U.S., Projections Managing Partnership, solar and wind energy jobs, Yahoo Finance News on February 4, 2019 by Helen Deffenbacher.